Control the colony with the convenience of a gel. Kills the queen. Destroys the ants in the nest. 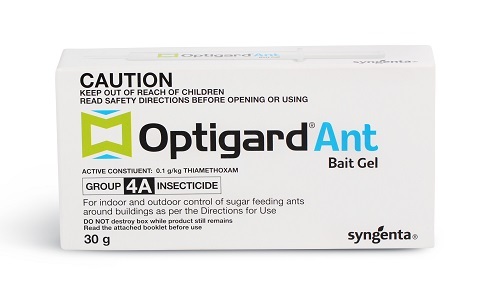 OPTIGARD Ant Bait Gel is not just convenient to use; it’s also one of the leading baits on the market for controlling sugar-feeding antinfestations. Use it to control entire colonies in homes, commercial settings, schools and hospitals, and be confident it will eradicate not just the ants you see, but also the ones you can’t. How does OPTIGARD control the entire ant colony? OPTIGARD is infused with thiamethoxam: a highly palatable, non-repellent active ingredient. Worker ants that feed on OPTIGARD return to the nest and transfer thiamethoxam to the colony and queen. Total colony control can be achieved within 7 days, with workers reduced within just 48 hours. Pest Talk - What is the difference between ant and cockroach gels?